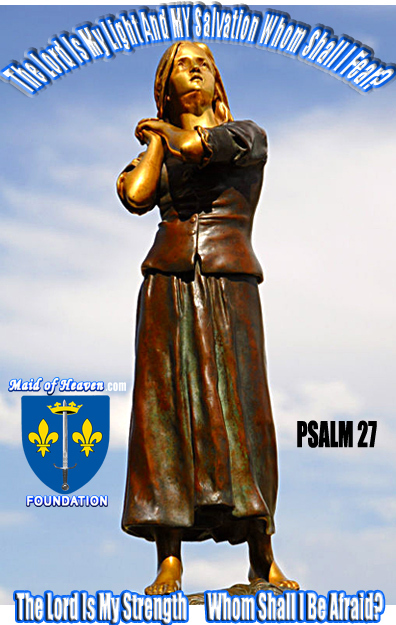 The mission of The Maid of Heaven Foundation is to fight evil in the world today and to help all freedom loving people to be able to effectively fight and overcome evil by learning from and being inspired by one of the greatest and most admired people to ever live: Saint Joan of Arc. 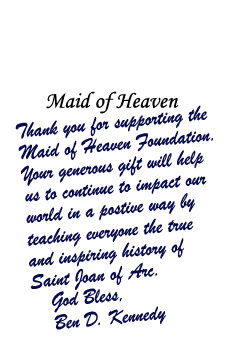 We at The Maid of Heaven Foundation feel that by teaching St. Joan’s true history as we do we can instill in all people the same passion that she possessed to Love God and Live Free which was the secret to her incredible success in life and the key today to defeating the forces of evil and restoring freedom to all of humanity. LOVE GOD! The example of Joan of Arc's faith and love for God is so powerful that it inspires virtually everyone and can help those that have no faith to want to know God and can also help those who already believe to obtain a much deeper faith and relationship with God. LIVE FREE! The very name Joan of Arc symbolizes freedom because of the great military victories and leadership that Joan provided to her people in gaining freedom from the tyranny of a foreign invader. At a time such as we are now living in where so many people in the world, even Americans, no longer seem to know how to live free it is Joan who gives us the pure example of what it means to be free and how to properly fight for freedom. These two guiding principles inspired by St. Joan and her incredible life influence everything that The Maid of Heaven Foundation does to achieve our mission. For more details about us please visit our Who We Are page. Ultimately The Maid of Heaven Foundation is dedicated to anyone anywhere who has ever had a passion in their heart like St. Joan of Arc to want to be completely FREE. If you admire Saint Joan of Arc and believe as we do that teaching her life’s story is a powerful way to inspire people everywhere to achieve excellence in their own lives for the betterment of all humanity then please JOIN US here at The Maid of Heaven Foundation and BECOME A PART OF OUR ARMY THAT IS FIGHTING EVIL AND RESTORING FREEDOM TO HUMANITY! The Maid of Heaven Foundation is a non-profit charitable organization established in 2016 that is approved by the IRS as a charity so your donations are tax-deductible. Any and all donations are greatly appreciated and help us to achieve our mission including keeping The MaidOfHeaven.com website online which is the world's largest educational resource about Joan of Arc. To make a donation by credit card simple click the button below or choose one of the support level options listed next on this page. BECOME A FULL MEMBER OF THE MAID OF HEAVEN FOUNDATION AND RECEIVE THE 2019 JOAN OF ARC PRINT Anyone who donates at least $30 will automatically become a full member of The Maid of Heaven Foundation for one year and receive the 2019 Joan of Arc Print shown below as a thank you gift. 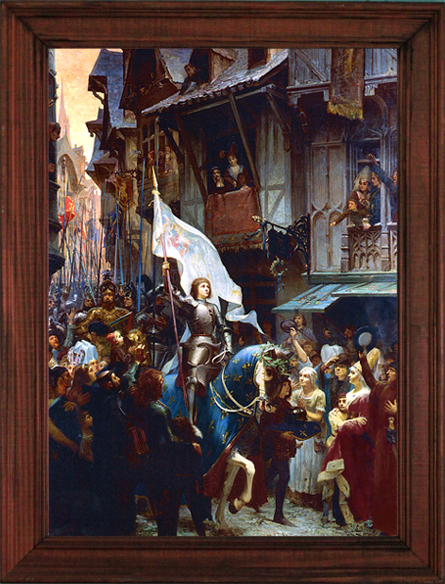 This beautiful Joan of Arc artwork is suitable for framing and will fit well in any standard 8x10 picture frame. For more details please click the picture below to see the full size of the print and see how great it looks framed. Go Here for information about Family Memberships. Another great benefit of becoming a full member is access to all of our special resources listed on the MEMBER RESOURCES PAGE accessible only with a username and password that you will receive after you join. ***ADDITIONAL GIFTS TO EVERYONE WHO DONATES AT LEAST $30*** Will Include a 4x6 Photograph of Joan of Arc on Horseback as shown above on this Page! THE BEAUTIFUL 2019 JOAN OF ARC PRINT BELOW IS NOW AVAILABLE! 8 X 10 MOUNT UP WITH WINGS AS EAGLES PHOTOGRAPH! The airplane in our Mount Up With Wings As Eagles Photograph below was built in 1940 to help train the pilots that were needed to fight against the tyranny of fascism during WWII. Unfortunately there is an even greater need today to educate and train people how to resist and fight tyranny which is a central part of the work that The Maid of Heaven Foundation does every day but WE NEED YOUR HELP! 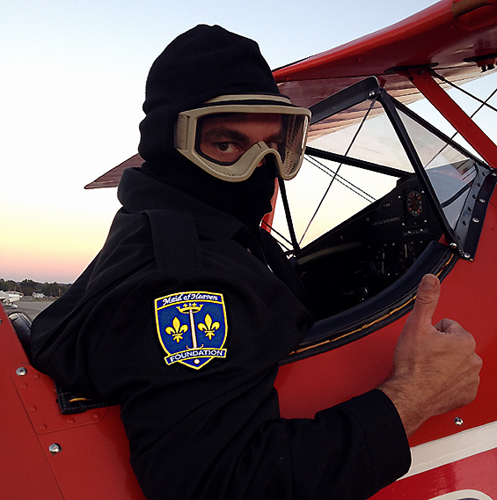 Please consider donating at least $60 and become an Eagles Wings Supporter to help us to better accomplish our mission of educating and inspiring people everywhere to live free! 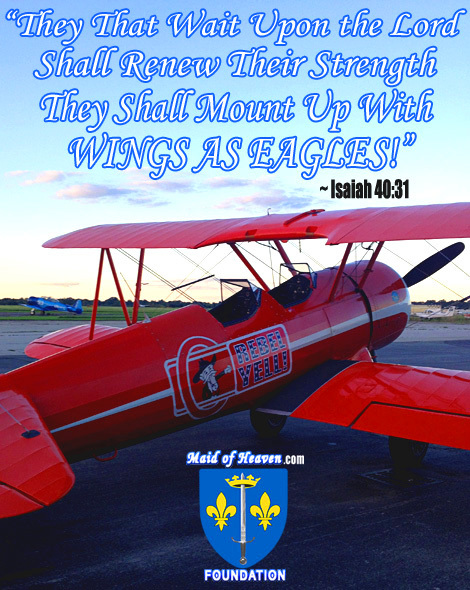 With your gift of at least $60 you will receive an 8 X 10 copy of our spectacular Mount Up With Wings As Eagles Photograph along with the 2019 Joan of Arc Print and Gifts. FREE TO EVERYONE WHO JOINS AS AN EAGLES WINGS SUPPORTER! BECOME AN ELITE SUPPORTER AND RECEIVE A SIGNED COPY OF THE BOOK MAID OF HEAVEN: THE STORY OF SAINT JOANOF ARC! Anyone who donates at least $100 or more will receive a signed copy of the book Maid of Heaven in addition to the Mount Up With Wings As Eagles Photo along with the 2019 Joan of Arc Print and all other Gifts. Genuine new copies of the book Maid of Heaven are only available through The Maid of Heaven Foundation and each one is personally signed by author Ben D. Kennedy. 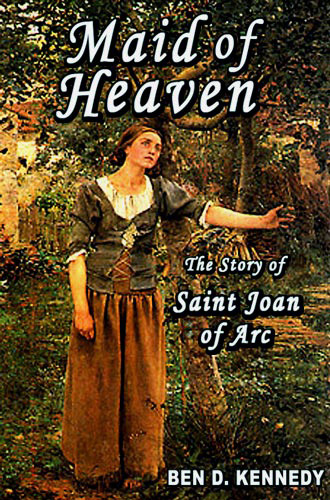 This is THE BOOK ABOUT JOAN OF ARC that inspired the creation of MaidOfHeaven.com and The Maid of Heaven Foundation and will inspire everyone who reads it with the unforgettable and inspiring story of THE Maid of Heaven: St. Joan of Arc. Click here for more details about the book Maid of Heaven: The Story of Saint Joan of Arc Help us to restore Freedom to humanity NOW! 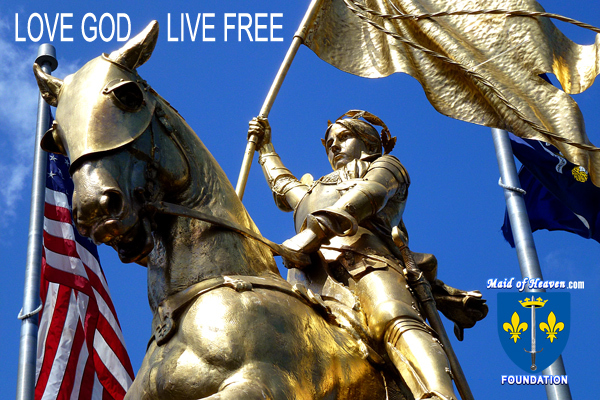 and be inspired by the greatest Freedom Fighter to ever live: St. Joan of Arc! 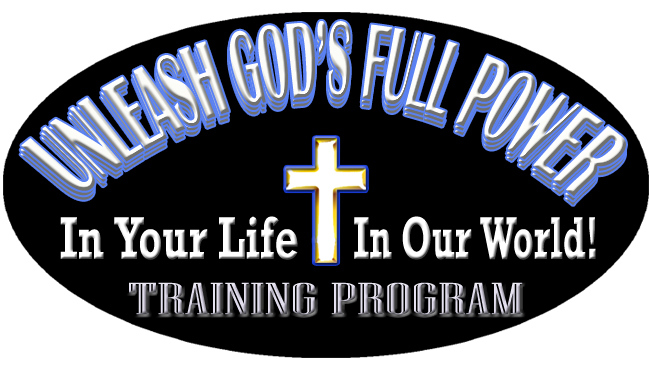 This special training program is completely FREE and available to anyone who wants to use it to unleash God's full power in their life and in our world. By helping Christians to be able to unleash God's full power to overcome evil we are helping to restore Freedom to all of humanity so please help us by encouraging everyone to participate with us in this Divine calling. Please click the logo above to learn more about this program and how you can participate. 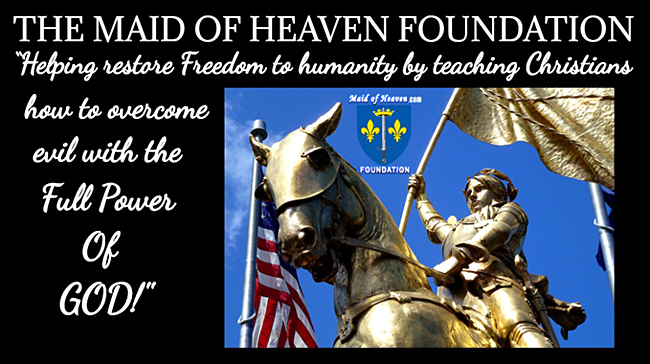 The Maid of Heaven Foundation is taking the lead in helping to restore the Spiritual Foundation of Freedom to the USA because this was exactly what St. Joan of Arc herself did for her people and what is so desperately needed in America today. 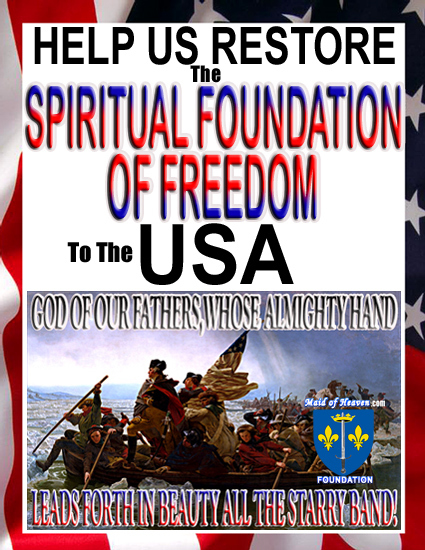 Please click on the picture below for more details about what you can do to help us restore the Spiritual Foundation of Freedom to our troubled country. GETTING PEOPLE TOGETHER WHO HAVE A PASSION FOR FREEDOM IN LOCAL CHAPTERS As Edmund Burke the favorite philosopher of America’s Founding Fathers once said: “When bad men combine, the good must associate.” The Maid of Heaven Foundation is therefore encouraging everyone who has a passion for Freedom like St Joan of Arc to get together with other like-minded people and organize yourselves into local chapters to inspire and encourage each other. 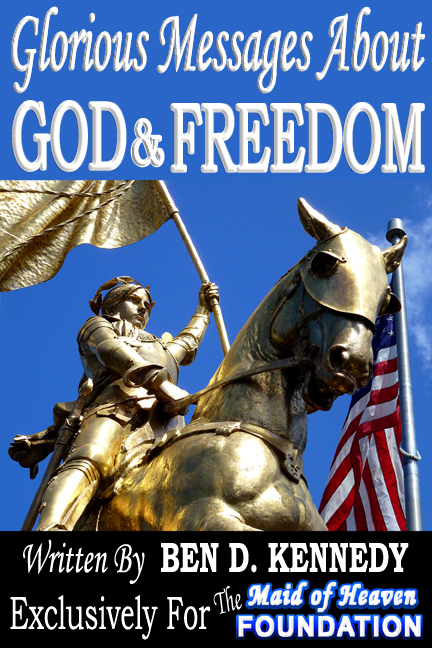 Such small groups are a great way to really fan the “brushfires of freedom” in the minds of people everywhere by learning more about great freedom fighters like St. Joan of Arc and utilizing all the resources about God and Freedom available through The Maid of Heaven Foundation. 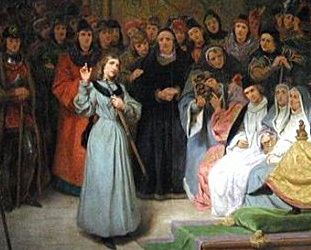 You can also enjoy socializing at events like parties to celebrate St. Joan of Arc’s Birthday on January 6th every year. And once a group contains enough members to qualify then you can become an official chapter of The Maid of Heaven Foundation and operate under our tax-free status umbrella in order to raise money to support your local events. So find some good people around you to associate with and become a part of our army here at The Maid of Heaven Foundation that is fighting hard to restore Freedom to humanity. 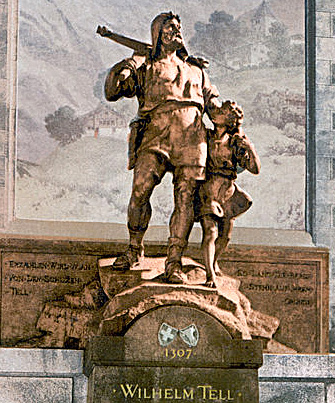 JOIN IN WITH THE TENS OF THOUSANDS OF PEOPLE ALREADY PARTICIPATING IN THE WILLIAM TELL PROJECT! 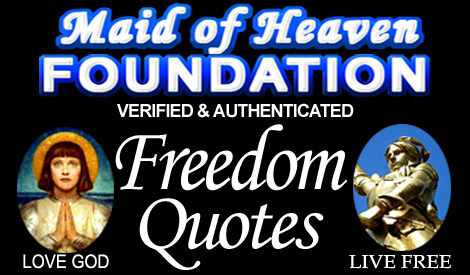 Each and every day The Maid of Heaven Foundation features a famous Freedom Quote to help encourage and inspire you with the wisdom of great freedom fighters of past renown. 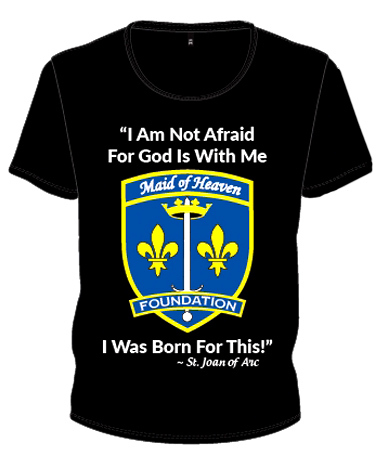 Joan of Arc T-Shirts Now Available!